There's a strange new house in the neighborhood according to Google Earth. 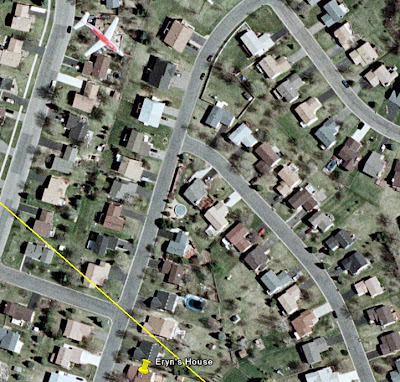 It looks like some of my neighbors moved into a red airplane, or at least appended one as a new story on their abode. Fortunately, it's on the block over, so we don't have to look at it all the time, like we do the r.v. a few houses down. Eryn and I were looking at Google Earth because we were tracking how far some of the geocaching tags we've found have gone. There's a little blue car and little green car that started in Eagan that are racing. We found the little blue car, and so far it's gone about 690 miles. But the little green car has gone 9150 miles! Someone picked it up and took it to New South Wales. Boring SAHM might be amused to find it's gone from my back door to her back door. I wonder if I could have just sent my used Burley to her with some expatriate. We went geocaching today. 1.4 miles round trip. A little singing on the way there. Much singing on the way back to encourage walking, to the amusement of a family of kids, a gardener and two people walking their dog, who all heard renditions of The Ants Go Walking, The Girl That I Marry, and What Shall We Do With a Drunken Sailor. Here's some nature on the way to the cache. A big puffball. As you can see, some kids beat us to it and poked sticks in it. I gave it a tap to encourage dissemination of the puffball spores. These are spoilers for the cache we found - so don't look if you've ended up here from geocaching.com. This particular cache was in an area of serene beauty, a natural environment unsurpassed in the quiet stillness of a setting sun. Yep...that's a bus stop bench in a parking lot conveniently empty on a Thanksgiving weekend. Here Eryn models the whole geocaching process, from GPS unit to small tin container to waterproof plastic bag to pencil and paper for signing our nom de plumes. Walking sticks are not mandatory, and even to be discouraged if you have to constantly stress "don't poke your eye out." Which she didn't do, but she did manage to scratch her forehead with the stick. That's so cool, but it seems I may need to re-read my Harry Potter books to uncover the hiding place of the Green Little Car! This may be of interest to you - Geocaching Online has a regularly updated blog and hundreds of links to how-to's, information and more.